A drama-comedy character study, Grandma is an engaging story enhanced by provocative characters and excellent performances. Elle (Lily Tomlin) is a fifty year old (or so she claims) grandmother, ex-poet, unemployed academic, lesbian and staunch feminist. Following the death of her long-time partner, Elle is now breaking up with the much younger Olivia (Judy Greer) after a four month relationship. Elle's granddaughter Sage (Julia Garner) shows up unexpectedly seeking help: she needs more than $600 to pay for an abortion scheduled later that day. Elle is also broke, but she decides to help by trying to collect money from a variety of sources. The pair visit Sage's boyfriend Cam (Nat Wolff), Elle's bookstore owner friend Carla (Elizabeth Peña), tattoo artist Deathy (Laverne Cox) and Elle's lover from a long time ago Karl (Sam Elliott). Finally, Elle and Sage have to gather up their courage to also seek help from Elle's daughter and Sage's mother Judy (Marcia Gay Harden), a perpetually high-strung businesswoman. Written and directed by Paul Weitz, Grandma is a compact 79 minutes delving into the world of a fading scholar. 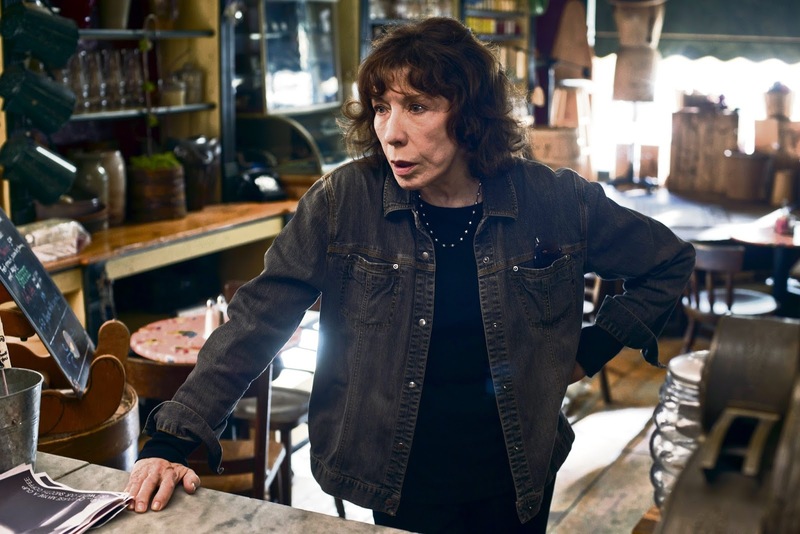 The film is a showcase for 76 year old Lily Tomlin, who dominates the screen with a caustic performance as Elle. This grandma is bitter, foul-mouthed and proud of it, her life reduced to no debt, no apologies, and not accepting nonsense from anyone, and Tomlin brings her to life with gallons of bravado. With no wasted scenes, the story is small and personal but also elaborate enough to explore relevant themes for Elle's generation, from the abortion question to the status of feminism and exactly where the battles for women's rights have landed. Weitz steers a delicate course, avoiding any sense of moral high ground or preachiness. Elle may have lived on her own terms, but her life is cluttered with the wreckage of her decisions, including an unfulfilled career and, closer to home, broken relationships with daughter Judy and former lover Karl. Elle achieved independence, but far from triumphantly. The film cruises through the interactions Elle initiates in her quest to find the money Sage needs, and grandma's world is revealed through the eyes of the granddaughter, oscillating between resigned, panicked and horrified by grandma's behaviour. Weitz challenges the millennial to assess whether the paths paved for her by the warrior women of the 1960s and 1980s are worth following. Julia Garner is excellent portraying a young woman forced to understand, all too closely, where she came from, but still inquisitively looking for her own trajectory. Sharp and feisty, Grandma is worth knowing and does not overstay her welcome.